Welcome to part 2 of our company analysis guide! Let’s get right into it. In Part 1, we analyzed the company’s past performance and determined whether or not the company had a positive track record. This is important because it gives investors confidence that management can deliver further growth. With that in mind, it’s time to look forward and analyze the company’s expected growth rates. As a reminder, we will be using hypothetical stock “ABC” as our model company. Outside of creating your own forecasting models, which is not realistic for the average investor, there are two sources by which to inform yourself on a company’s expected growth; the company, and analysts’ covering the company. The most common terms used by companies to inform shareholders of future earnings expectations are “guidance”, “outlook”, and “forecasts”, while analysts typically use the term “estimates”. For the purpose of this document, we will use “outlook” as an all-encompassing definition to define future expectations put forth by the company and the term “estimates” to define analysts’ future expectations. Company Outlook: Expected Earnings (Net Income) Growth. Earnings growth is the most common metric used to evaluate a company. Therefore, it is important for investors to identify the company’s earnings growth rate. At the very least, most companies will provide their earnings outlook for the coming year. Likewise, in most cases, they will provide a target growth range. Some companies will provide outlook over the short term (1YR), mid-term (3YR), and long term (5YR). We’ve already established that one of the criteria for inclusion on a growth list is an expected growth rate of 10%, and we will use that same criterion here. Criterion – Company Outlook: Earnings Growth >10%.Revisiting our model company, stock ABC has provided outlook through 2020. Although they have not provided specific earnings targets, they have provided outlook with respect to revenues and margins. Given that they expect margins to rise, investors can expect that earnings will rise at a greater rate than revenue. As a result, we would expect at minimum their earnings growth would equal sales growth, which we will look at next. 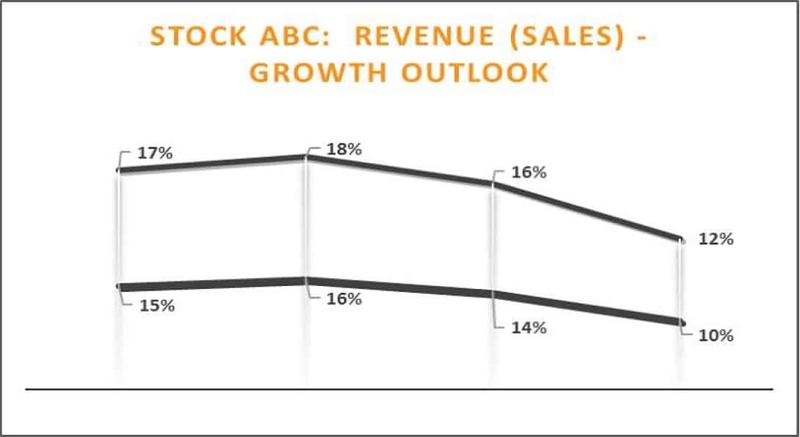 Company Outlook: Expected Sales (Revenue) Growth. As mentioned in our historical analysis, some high growth companies are operating at a loss and more emphasis is put on sales growth. In such cases, companies are more likely to put forward sales numbers as opposed to specific earning targets. Much like earnings growth, investors should look for at least 10% sales growth. Criterion – Company Outlook: Sales Growth >10%Revisiting our example again, stock ABC has provided a targeted revenue range through 2020. The top line in the graph is the high end of their outlook, while the low end is the bottom line. Companies usually release guidance in quarterly press releases, investor presentations, earnings conference calls and annual reports. The majority of these documents (including conference call transcripts) are available on the company’s website, and if not, will be available through SEDAR. Similar to the company’s outlook, we are once again looking for expected earnings and sales growth in excess of 10%. 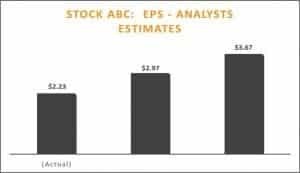 Example Stock ABC: In the chart on the next page, the numbers refer to the company’s actual EPS posted for the year. At the time of writing, the company had not finished their second fiscal year, so the number is still an estimate with a combination of actual and estimated quarterly earnings. Finally, you will see the year afters fiscal estimates. Based on the information provided EPS is expected to grow by 33% next year and 24% the year after for a compound annual growth rate of 28.5%. 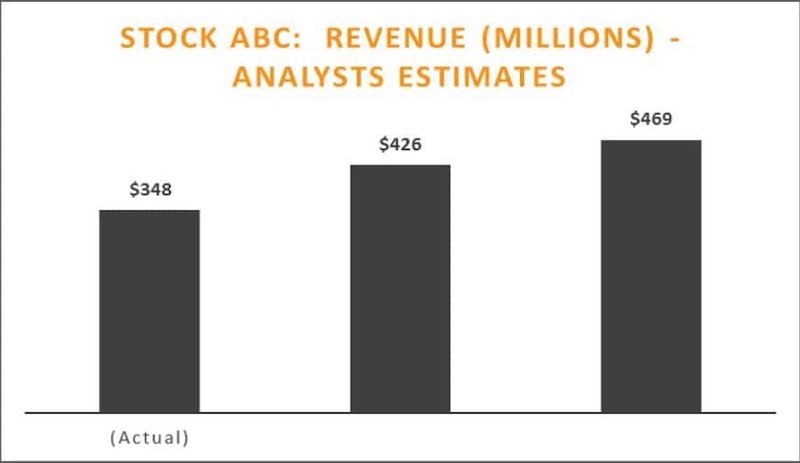 Similarly, revenue estimates for stock ABC can be found below. Over the next year, revenue is expected to grow 22% and for the year after, it is expected to grow 10% for a compound annual growth rate of 16%. With two steps complete, we are starting to get a better understanding of our model firm, stock ABC. You might have noticed that EPS estimates have a higher expected growth rate than revenues. This is completely normal as EPS can be impacted by other factors such as reduced share count and increasing margins. In the case of stock ABC, the company is forecasting that margins will increase each year through 2020. As such it is expected that all else being equal, the company’s EPS growth rate will exceed that of their revenue growth rate. Although we have collected quite a bit of information, and it has taken quite a bit of time, we aren’t even close to done yet! Next up, Market and Industry Analysis!